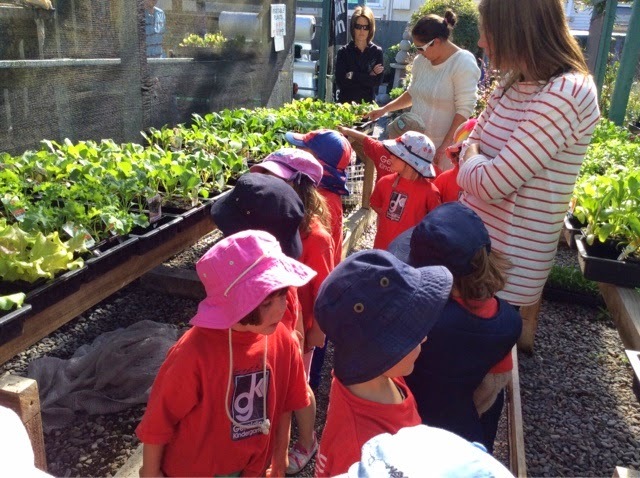 Purchasing and planting the incredible, edible garden! 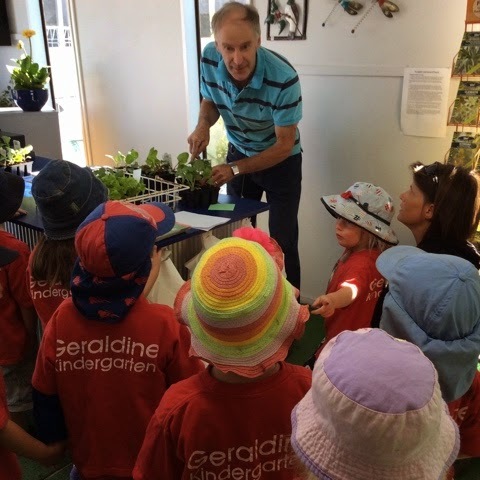 Heather and our wonderful parents took the children to the Garden Centre to purchase some vegetable plants to go in purpose built community garden. Gardening gloves on and gardening tools in hand they prepared the soil to plant the young plants. Inside the Kindergarten the children fetched the water they needed to feed the roots. The edible garden is a community garden and it is so important for everyone to particpate like Tayla's Mum, Shannon helping with the planting. 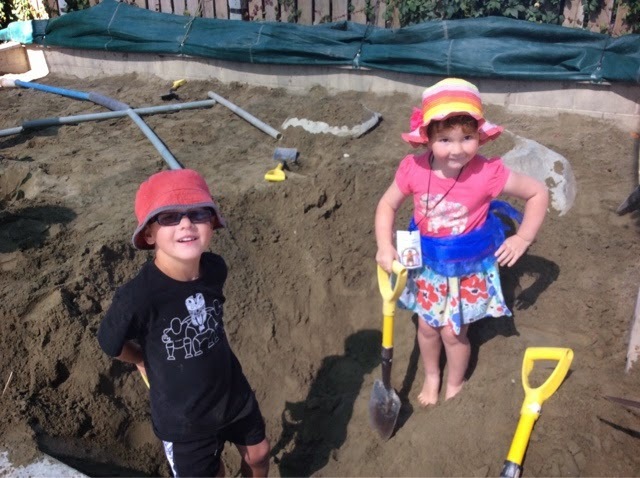 The Kindergrten children will be kaitiakitanga of the garden, the guardians, but we deliberately left planting spaces for nga tangata/people in the community to contribute too. We get the job done /Ka oti i a mātou ngā mahi! 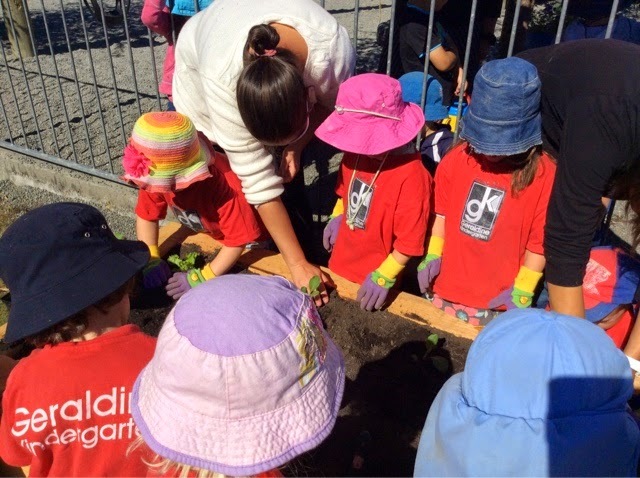 We are delighted to be part of a community driven venture to build a garden outside the Kindergarten fence to grow vegetables for the community. 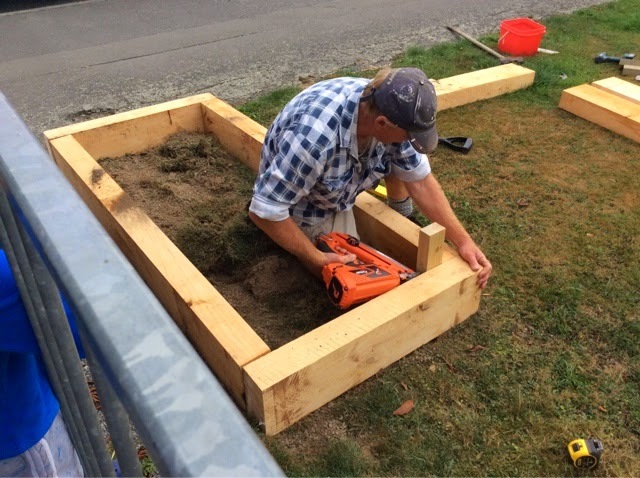 With Lindsay's expertise to construct the garden and the generous provision of the Timber by ITM in Geraldine we can plan a vegetable garden with the children. By growing the vegetables in the garden we will be enouraging nga tangata within the community to come and pick the produce to have in their homes. 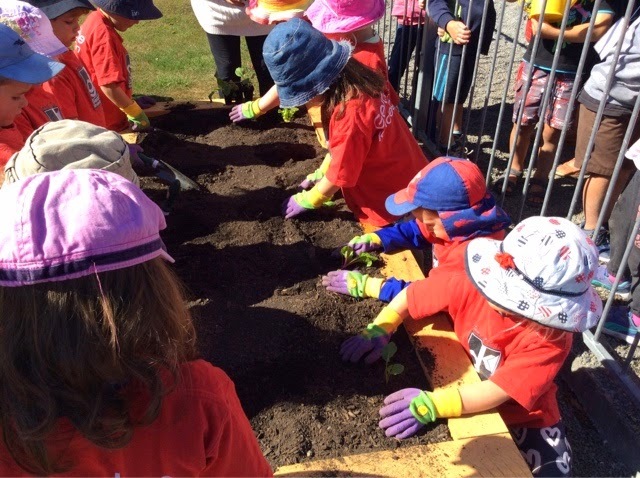 We would like our families/whānau to support us and community by pulling a few weeds and cutting back when it is neccessary to keep the garden flourishing with wonderful produce. We really appreciate Lindsay's help to get us started. Paris arrived with her Mum who was going to do a very important job in the community - paint the Toy Library building they have just purchased. Not to be out done! Tracey suggested to Paris that they do their own community painting. 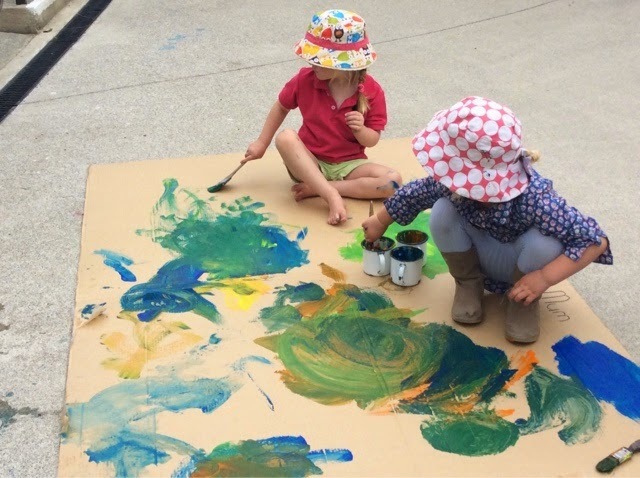 Paris was grinning with excitement and once underway the 'girl team' (Pippa suggested that is what they should call themselves) came together to paint their 'Toy Library'! Kei te pai mo to tahi mahi nga kotira! 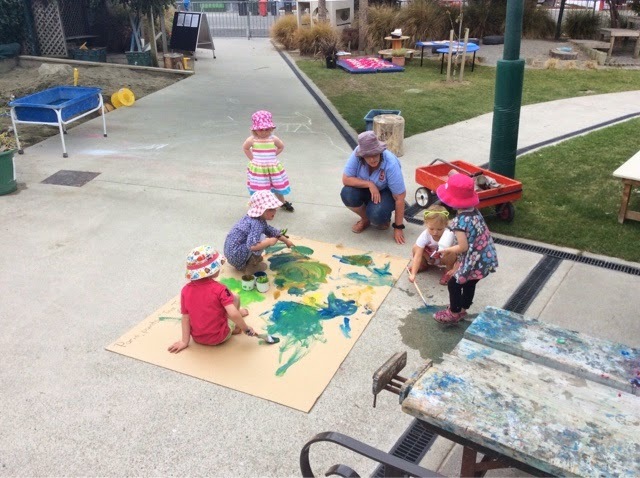 The work they did will be rewarded by taking the 'Toy Library' painting down to the real Toy Library and place it on the wall reflecting the replication and transferring of what happens in the community happens right here at Geraldine Kindergarten; building great relationships/whanaungatanga in the kindergarten, community and beyond! 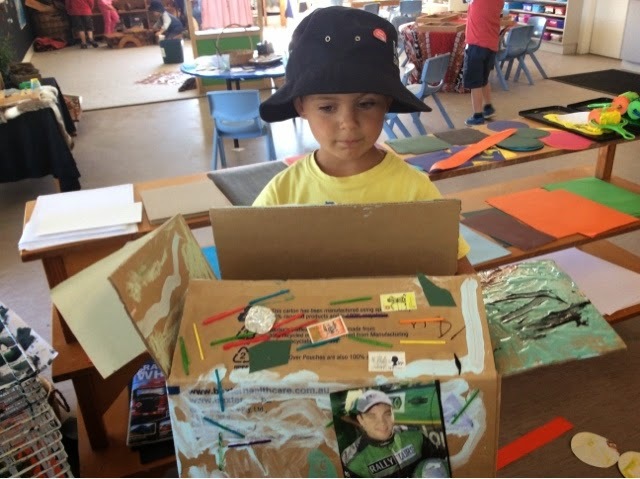 Some of our morning children have been using their creative skills to build a " fast " racing car . A quick comment from Tracey then generated a week of research and building of racing cars , improving the specs each day . " Wow that looks like the kind of rally car Hayden Paddon would be interested in driving in a race"
" Who is Hayden Paddon?" 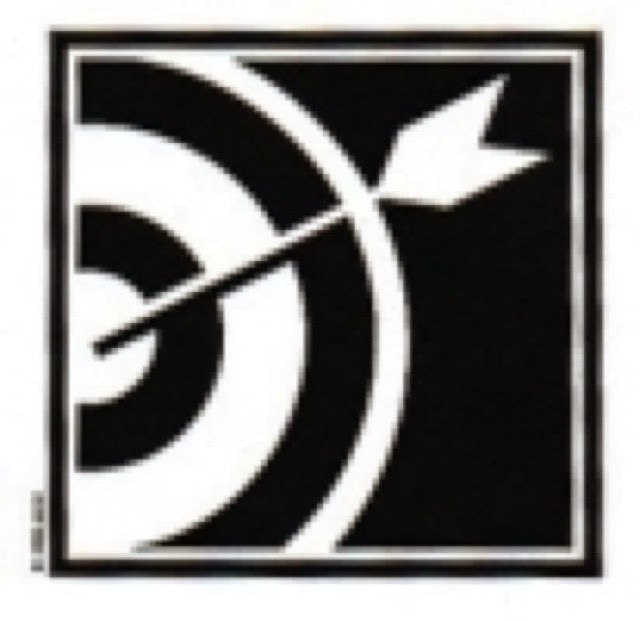 Murphey then enquired sparking the interest that was sustained all last week and continues to be explored in to this . So this morning Archie researched some tyres that he thought would be ideal for his bike at home in the snow and Hayden's new racing car he was about to build him . Tom supported him with ideas that he transfered from his experience last week . It was a lovely example of ako in action where a simple comment intentionally shared by a teacher has resulted in children learning alongside one another and sharing their new knowledge with others. This afternoon we spent a period of time in with our kindergarten bantams Brownie and Silkie. James looked through the fence and then asked "Can we visit the chooks?" With that suggestion the other children outside also wanted to join in and share the experience. Before we entered the area we talked together about showing Manaakitanga/ care and respect for Brownie and Silkie, "don't chase them" "being quiet" were some of the ideas shared. This is great he rawe tēnā! It wasn't long and we were able to go in and see the bantams, Brownie was having some food and Silkie was exploring some of the shrubs around the garden. 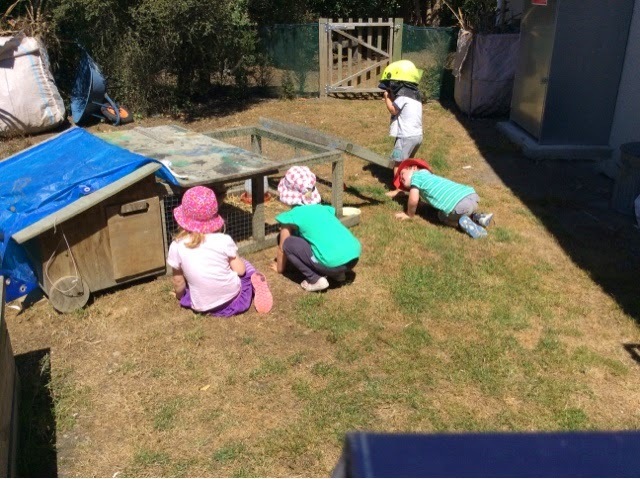 Our afternoon children showed manaakitanga towards our bantams, sitting quietly around the cage, talking quietly about what they could see. They were managing their impulsivity by not chasing after the bantams as they ran off. We then explored the hutch a little further looking to see if Brownie and Silkie had layed any eggs for us to collect. "Not today" Pippa commented as she looked into the nesting area. 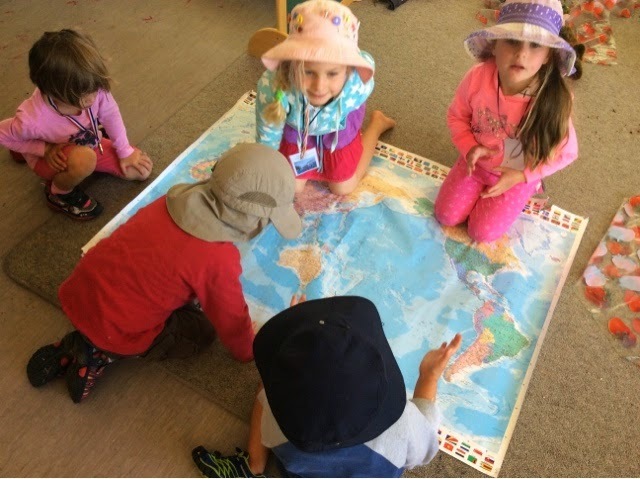 Having bantams at kindergarten allows the children to make links between kindergarten and home, as many of them have bantams because of living in a rural area. It provides the children with an opportunity to develop respect and compassion towards animals as they help look after and feed the bantams during the week. Brownie and Silkie are also a great tool to help the children build a sense of belonging and settle into afternoon kindergarten. The children often use Brownie and Silkie as a strategy to settle into their kindergarten day after their parents have left. 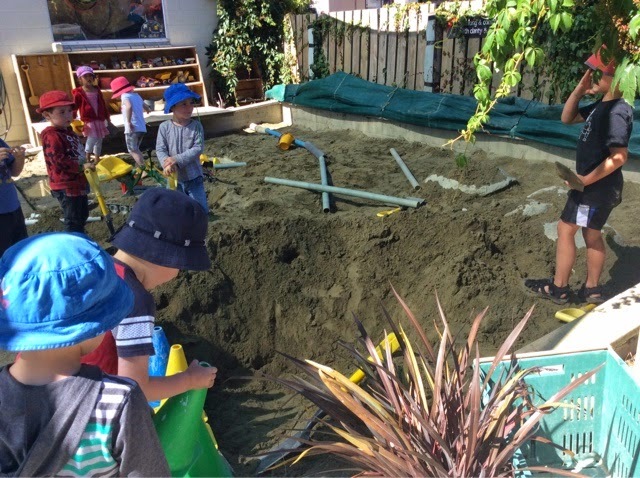 This morning the children made the most of the sunshine playing outside in the sandpit, after a period of time Gael noticed a group of children working interdependently in the sandpit to achieve a common goal. Because the children looked so busy Gael was intregued to see what was happening so she went over to investigate a little further. 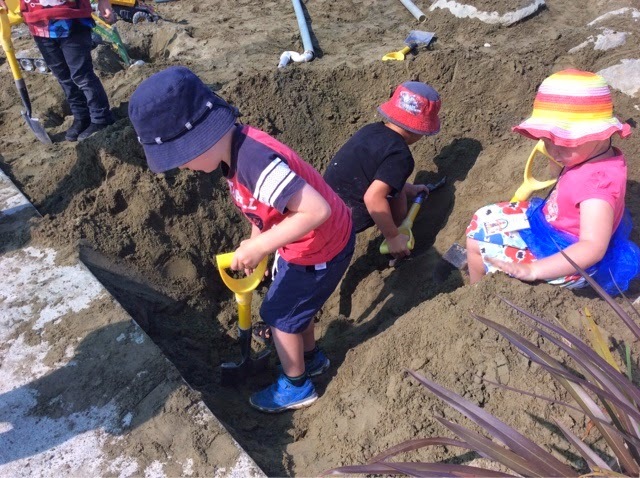 As the children worked together they explained they were digging a big hole. 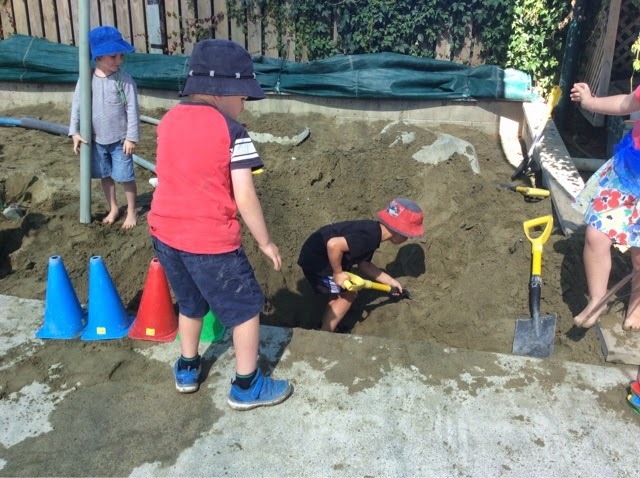 James and Opal were very proud of the hard work they had been doing and they were very excited to show Gael how deep their hole was, James happily stood by the concrete measuring how deep the hole was on himself, wow up to his knee! 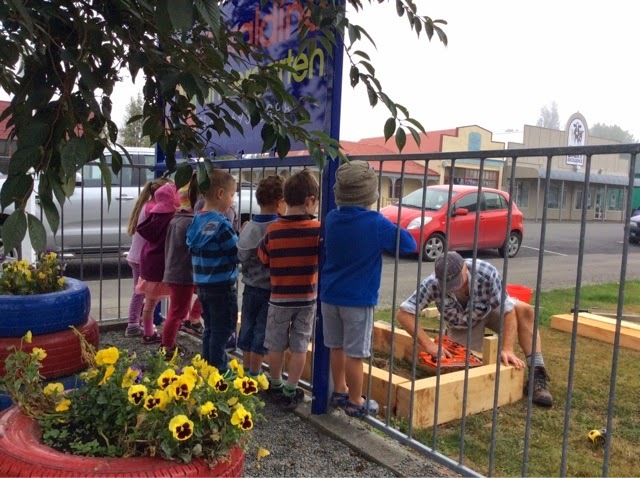 After a short period of time Isaac noticed that because the hole was getting so large and so deep beside the concrete they needed to take precautions to keep the other children at kindergarten safe. 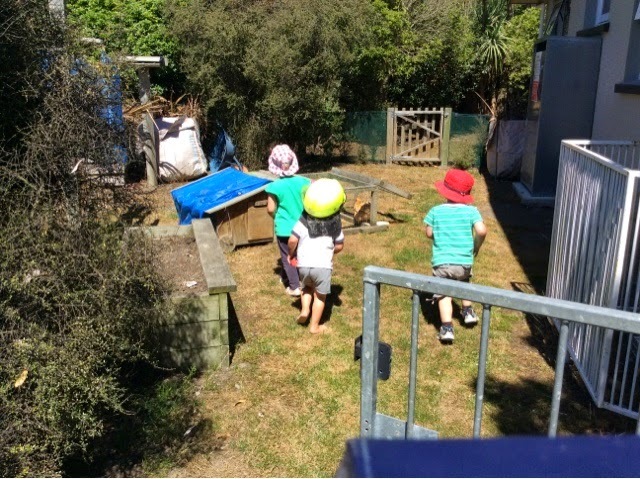 Off he went to the shed, quickly returning with our bunch of cones, he then began lining them up on the edge of the concrete beside the sandpit to alert other children of the danger. This is great he rawe tēnā! 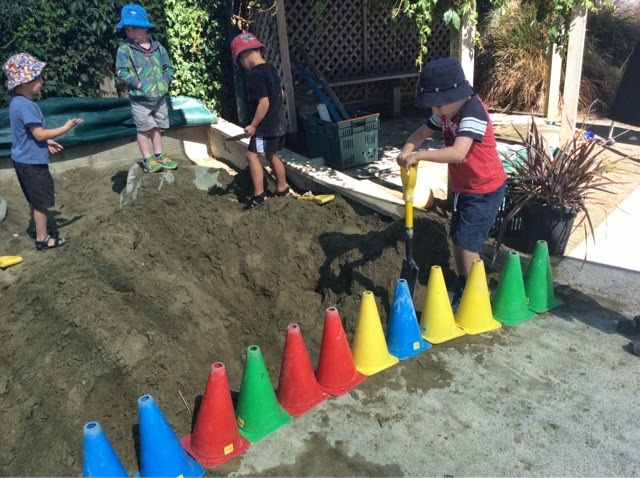 As the children work together to achieve a common goal, they use their large motor skills as the dig the sand, they showed the habit of mind perservering with difficulty as they continued to dig the wet heavy sand from the sandpit, taking them some time to get the big deep hole dug. 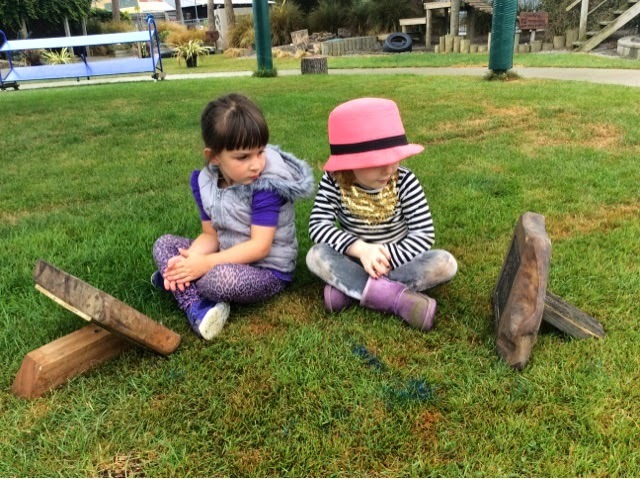 Another skill that was shown as the children worked together was manaakitanga/ care and respect as they recognised that it was now unsafe and then worked to minimise the risk to the other children around them. 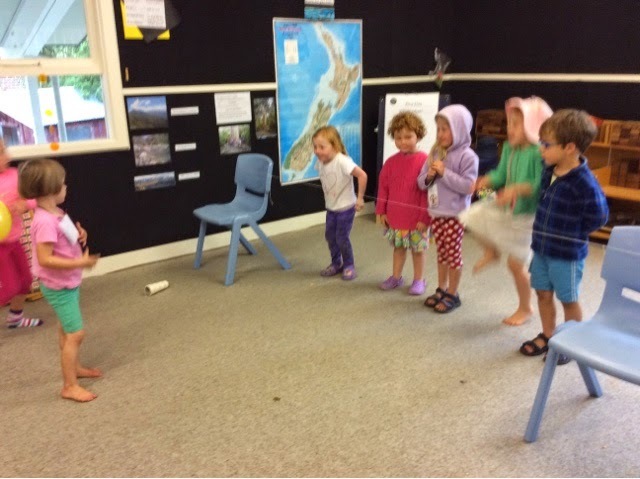 Manaakitanga is a skill we value highly at Geraldine Kindergarten. Keep it up , kia kaha ki tāu Mahi. 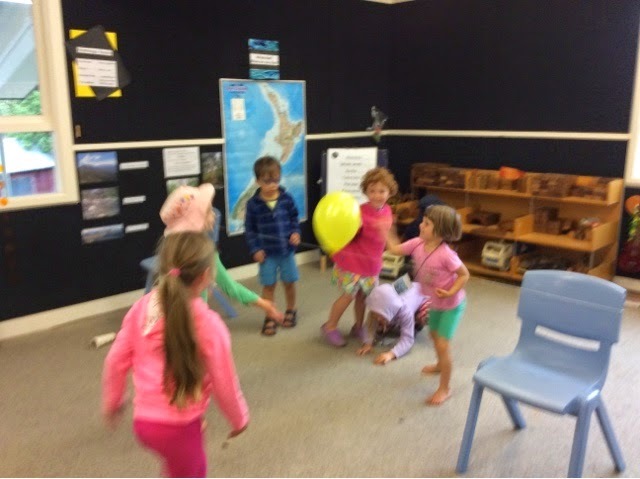 Today because it was raining outside and a little bit colder than usual, we noticed a lot more children inside which lifted the volume levels as children excitedly played and talked to each other about their weekend. 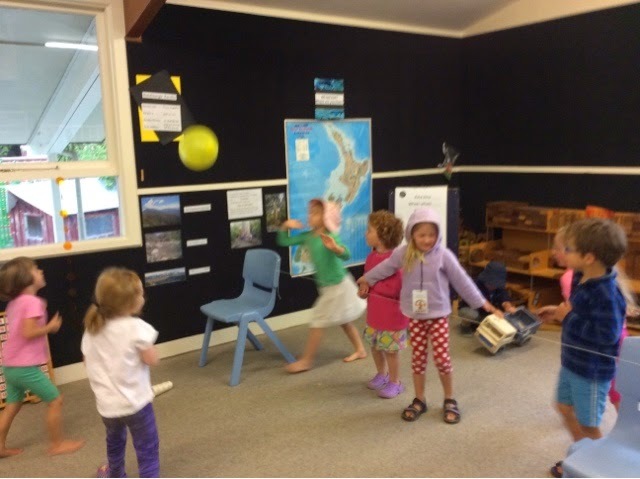 After a period of time Heather decided it would be a good idea to set up a group game that would allow the children to Mahi tahi/ work together. It wasn't long before we had made a net and got a balloon ready to play volleyball. After the rules had been explained we began playing in teams, working together and perservering with a new game. Children found it a little tricky to just pat the balloon instead of catching it. 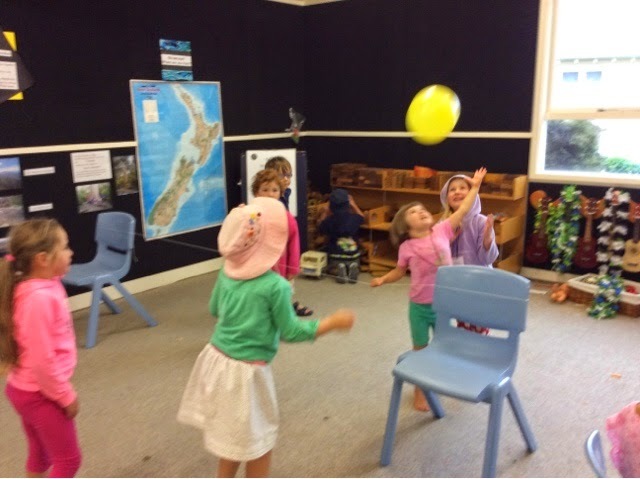 Having this game set up allowed the children a place inside to use some physical energy in a controlled and safe environment, as they played the children tested their skills at taking turns, hand eye coordination, spatial awareness as they watched out for their team mates when trying to get the balloon over the net and having fun with friends. Mahi tahi - Team Work! 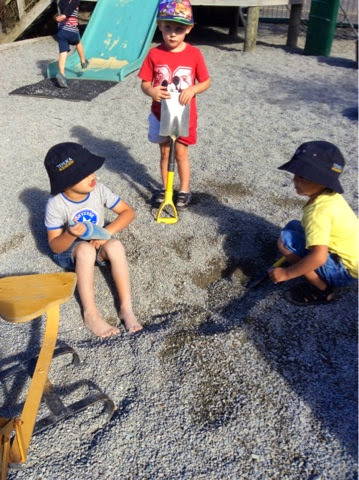 We now have two diggers at kindergarten and this week one has been placed on the stones with trucks. Children have taken a huge interest in moving stones from one spot to another in the back of trucks. But today Baxter, Murphey and Tom had a different idea! They had gathered some spades to use with the digger and began to dig. 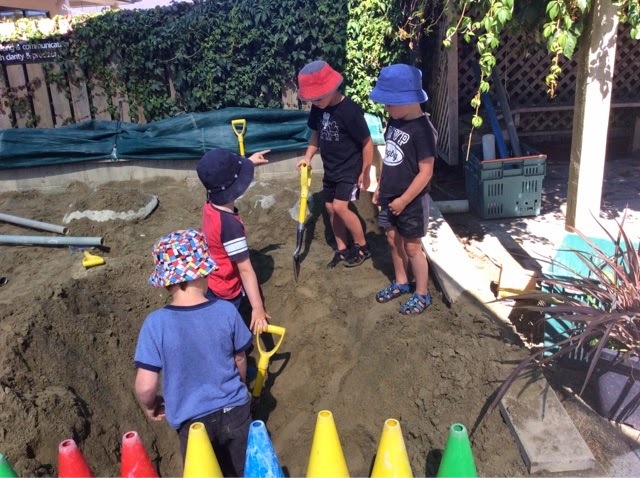 As they continued digging together it was decided that they wanted to see how deep they could get. A lot of team work was required as each of the boys took turns to dig in the hole all working toward the same goal. It was interesting to watch as Tom had a turn on the digger, that is bigger than our other one. So he had to think flexibly about the way he was using it, and eventually decided the best way was to stand while using the leavers to coltrol the bucket! Ke tahi te whakaaro pai - thats a good idea. We will ensure that a digger is out on the stones for children to use as they explore and find out about the different ways they can be played with. 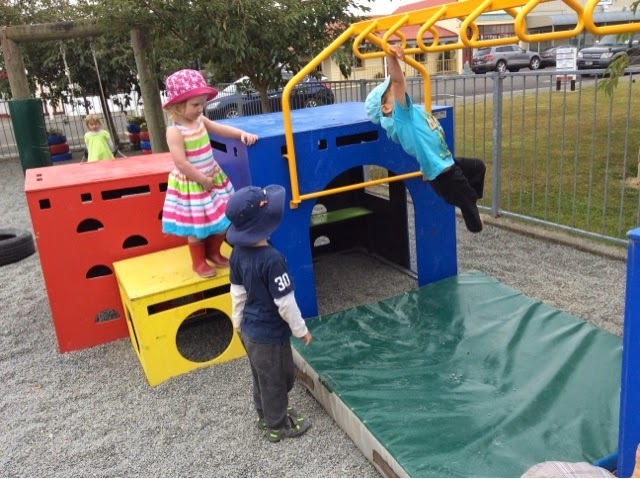 This afternoon Tyla was really persevering as she tried and tried again to make her way right across the monkey bars. Kua mahi pai koe - you have worked hard. "I can do it.... I can go all the way to the other side". So Lance showed us and by this time other children had gathered around really interested by what was going on. Everyone was so excited to give it a go and together we took turns or stood by watching as we talked about different techniques that both Lance and Tyla were using. 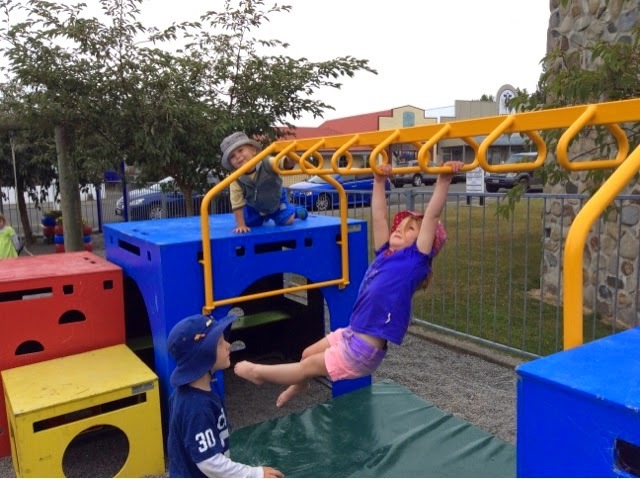 We cannot wait to see when the children return to the monkey bars on Thursday afternoon, maybe there might be some who watched this time ready to take a responsible risk and give it a go! This morning Toby found the magnetic people and settled into play. He used the different pieces of magnetic clothing and accessories and he placed them against the male or female bodies. It wasn't long until Toby made eye contact with me and turned around the person he had placed some pieces of clothing on. 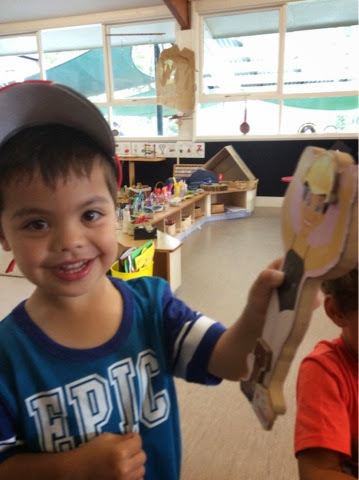 It was a ballerina, but Toby has thought really creativly about what he had put on her - a hard hat, one cowboy boot and a slipper!! He tino auaha tēnei - This is very creative. This was so funny, and we laughed together finding humour about what Toby had dressed the girl in. This continued for some time and it wasn't long before others became curious by what we were up to and came to join. 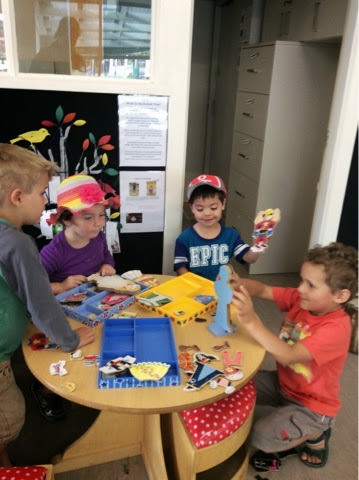 Mitchell, Opal and Chase joined Toby at the table and together dressed the people in very creative ways. Lots of communcaiton was happening as everyone chatted away about the different magnetic pieces they had found in the trays and where they were going to place them. The small group found humour together as they each created a different costume and shared what they had made. This happened over and over again for some time, each time laughing at one anothers creation. This was a fantastic expereince for all involved to interact and support the development of their whanaungatanga/relationships. 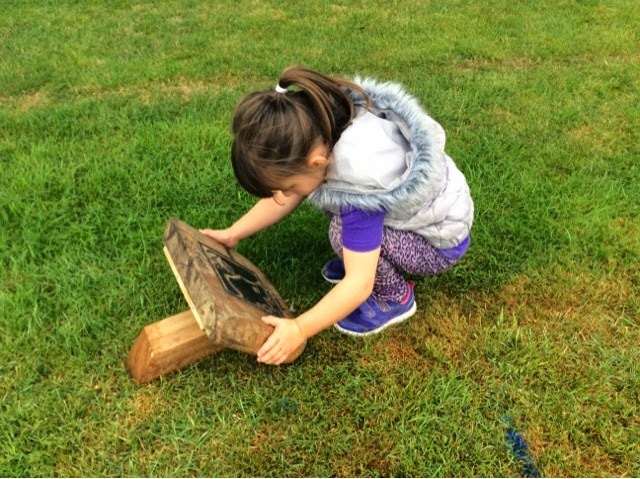 The Habit of Mind signs are found in the playground and Jessica, Addy, and Jorja were found studying them very closely. Jessica explained that they were their maps. "We are in a forest, a scary forest! We have to get out!" Addy comes up to Jessica and shows her map (striving for accuracy), "I've got the arrow!" Jessica jumps up and strides away with her friends following, "We have to go this way!" she instructs. The girlfriends are finding novel ways of playing with open resources that invite creativity of thought and action! 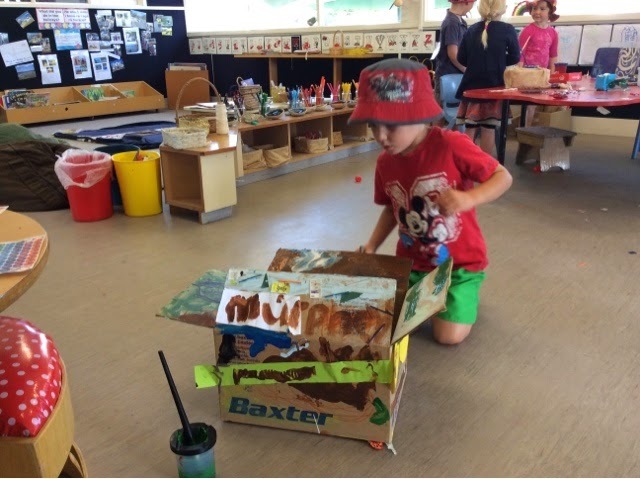 Ka pai to auahatanga - great creativity!